Owning an investment property can be far more affordable for potential investors than they think, particularly when they claim all of the tax deductions available to them. So getting property depreciation right is very important when you are selecting an investment property. To explain how claiming these deductions can assist an investor to purchase a property, let’s examine the situation of two average Australian taxpayers; Bill who feels he currently is unable to afford an investment property and Kate, who owns one investment property. What deductions can be claimed? The Australian Taxation Office allows income producing property owners to claim a number of deductions for expenses involved in holding a property including property management fees, rates, interest, repairs and maintenance. contained within the property over time. This deduction is known as property depreciation. Bill currently does not own an investment property though he would like to. He believes the cost of owning an investment property is not within his current budget. From his $85,000 salary, he pays $20,707 in taxes after he claims basic expenses such as a clothing allowance, donations and general accounting fees. Kate earns the exact same salary of $85,000. However, she saved a deposit and purchased a three bedroom rental property for $600,000 just over one year ago. Her property is rented at $545 per week, a total rental income of $28,340 per annum. The income earned from Kate’s investment property is also taxable, therefore her total combined income equals $113,340. In addition to the same basic expenses Bill claimed, Kate is able to claim deductions for expenses involved in holding the property, including management fees, insurance, rates, interest, repairs and maintenance. These expenses for a typical three bedroom property would amount to around $39,067. Kate also spoke with BMT Tax Depreciation and obtained a depreciation schedule which showed she could claim an extra $14,200 in depreciation deductions in the first financial year. As you can see, Bill’s take home income after he pays $20,707 in taxes is $63,293. Although Kate earns the same take home wage and is in a similar financial position to Bill, her income producing property also entitles her to claim a total of $53,267 in deductible expenses including depreciation. This further reduces her taxable income to just $59,073 making her income tax payable $11,814. 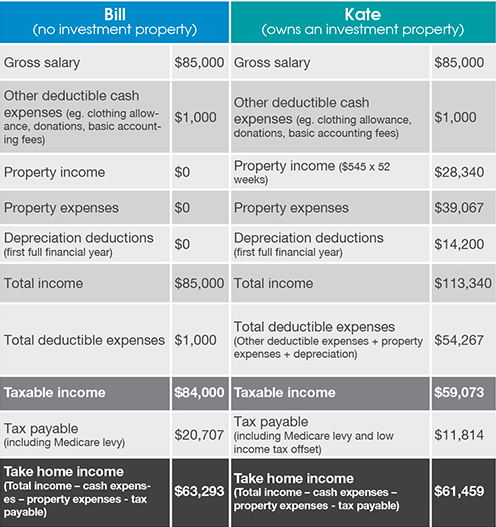 By maximising the deductions she can claim due to holding her property and claiming depreciation, Kate’s take home income is only a difference of $1,834 per year. Therefore, her property is costing $35 per week to own after tax. If you would like more information on how to make depreciation work for your property investment, download the free Deprecation guide on our resources page. Investors thinking of purchasing a property should always obtain expert advice from a specialist Quantity Surveyor on the depreciation deductions that will be available to them once they purchase a property. This article was prepared by and is reproduced courtesy of BMT Quantity Surveyors. This article is not intended to provide financial or taxation advice and should not be relied upon for that purpose. Investors should speak with their Financial Advisor and an Accountant to get a complete before and after picture of their individual tax situation based on their individual circumstances. The depreciation deductions in Kate’s scenario have been calculated using the diminishing value method and are based on the first financial year of ownership. This is a generic example only. Every person’s position is different. BMT are not Accountants or Financial Advisors and recommend that you seek independent advice.